Hollycooking's Blog | Recipes and commentary from Colorado. Accessible, delectable, cynical and correctable. I am obsessed with Sichuanese food, which is very unfortunate because my city is a Chinese restaurant wasteland. Fortunately, I live near a branch of the Asian grocery chain, H-Mart, which sells most, if not all, of the ingredients you need to make your own numbing/burning Sichuan concoctions. And, after much experimentation, I think I have arrived at a near-perfect recipe for Ma Pa tofu, the classic Sichuanese comfort food that combines tofu with meat, chillies and Sichuan peppercorns. I actually prefer this version to those I have eaten at Sichuanese restaurants, which tend to serve a more authentic version of the dish that is swimming in oil. (According to my cook book library, which includes just about every Sichuanese cook book available on Amazon, many authentic Sichuanese dishes require the chef to measure out cups and cups of oil like water or chicken broth, which is the only aspect of the cuisine I find a bit unappealing.) Anyway, I have been basically living on this version of ma pa tofu for the past two weeks. Warning 1: It is VERY hot. Which is the point. So if you don’t like hot food, you probably should not bother. This is not the kind of dish where you can dial back the chilies to, say, 1/4 tea spoon because, well, then it will not be ma pa tofu anymore. Warning 2: This dish requires some ingredients that you probably can’t find in your local Safeway or Kroger. But I promise, it’s worth it, even if you have to order some of the spices from Amazon. Boil several cups of water and pour it over the sliced tofu. Let the tofu soak in its hot bath for 15 minutes, then drain. Warm a large (10-12-inch) non-stick skillet over moderate heat. [A digression–although I own a wok, I started using a non-stick, flat skillet for stir frying after Cook’s Illustrated made the very valid point that American stoves are not built for woks because they generally do not have pits that the wok can sink into so that flames surround the outside of the sloped exterior. When you cook with a wok on a flat stove top, much of the wok’s surface area is inadequately heated.] Toast the pepper corns in the skillet (or, if you insist, wok) until they fragrant and slightly dark (2-3 minutes.) Grind them with a coffee grinder, spice grinder or mortar and pestle. In the meantime, prep all your food for the stir fry because it goes really fast and you won’t have time to prep while you cook. In a small bowl, combine the ginger, chili flakes, fermented black beans (if using), and chili bean sauce. In another small bowl, combine the soy sauce and sugar. Put all the ingredients (the 2 small bowls, the scallions, the meat, the ground pepper corns, the chicken broth, if using, or the water) next to your stove. Now, it’s showtime! Heat the oil (in the skillet or the wok) until it is very hot, i.e. smoking a little. Stir fry the meat for about two minutes until it loses all its pink color. Add the contents of the first bowl (i.e. the ginger, chili flakes, beans, and chilli bean sauce.) Stir fry about 2 more minutes before dumping in the contents of the second bowl (soy sauce, sugar). Add the (soaked, drained) tofu to the skillet/wok. Stir to cover everything with sauce. Now add the cup and a half of broth or water. Cook about 3 more minutes, to thicken up the sauce. (The original recipe calls for adding cornstarch, which I found unnecessary.) Turn off the heat and sprinkle the contents of the pan with scallions and the ground Sichuan pepper corns. Eat with plenty of water by your side and, if you’d like, some rice to soak up the sauce. This dish keeps well and tastes great as a leftover. It’s also good as a condiment/sauce to sprinkle for eggs and other bland food. Because I love to cook, I try to spend at least part of my birthday baking my favorite birthday desert. Which is fortunate because my favorite desert is not a cake or any other type of easily-purchased pastry. In fact, I’ve never seen it in a bakery case or eaten it at a restaurant. It is sort of like a cheese cake, but lighter. 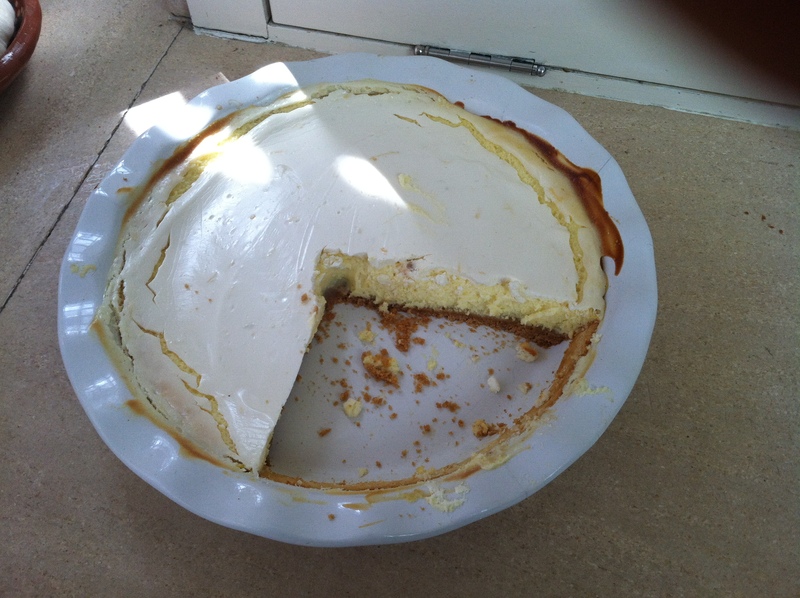 It’s also sort of like a lemon pie, but creamier and less tart. It’s called a cheese pie and it is the most delicious concoction in the world. Until I learned to cook for myself, the only place I had ever tasted it was in the kitchen of my mother, who is one of the best home cooks I have ever met, not that I’m biased. It’s extremely easy to make and the only person I’ve ever met who dislikes it is my sister Amy, who thinks it’s revolting. It was, of course, the desert I requested for every childhood birthday. In addition to eating cheese pie, I also enjoyed dancing my finger across its surface (when my mother’s back was turned, of course) because it reminded me of an edible ice skating rink. One of the chief joys of adulthood is that, after all the guests have been served, I have the desert all to myself! Combine all ingredients, then press into the bottom of a 9 inch pie plate and put the plate in the freezer while you make the filling. Preheat oven to 350 F. Beat cream cheese. Beat in sugar gradually. Add beaten eggs, sour cream, lemon and juice and lemon rind. Beat until smooth, then pour into chilled crust. Bake 25 minutes at 350. Combine all topping ingredients. When the filling has finished cooking for 25 minutes at 350, remove the pie from oven and carefully smooth the topping over the surface. The goal, obviously, is to make it look as appealing as possible to Dorothy Hamill. Return pie to oven and cook 12 minutes. Remove pie from oven and cool for at least half an hour. Then, refrigerate for at least 4 hours before serving. I made this dish because I miss my hometown. But my nostalgia is purely olfactory. When I was a child, my father instilled in me a lifelong distrust of outdoor dining. He warned us that Mr. Softee ice cream was studded with rat turds. He said that street vendors relieved themselves, then washed their hands in water they used to cook the hot dogs. Even the city’s many charming outdoor cafes were suspect because a stray fly or dirt clump might land in your salad. As a result, although I now enjoy dining outside, I have eaten very little street food, only occasionally making exceptions for a hot pretzel or roasted nuts (no urine-laced water). Still, every time I visit midtown, I am enchanted by the smells wafting from Halal carts piled high with roasted chicken and turmeric yellow rice. So I set out to create the Halal cart experience here at home, hundreds of miles away, rat turds optional. 1. 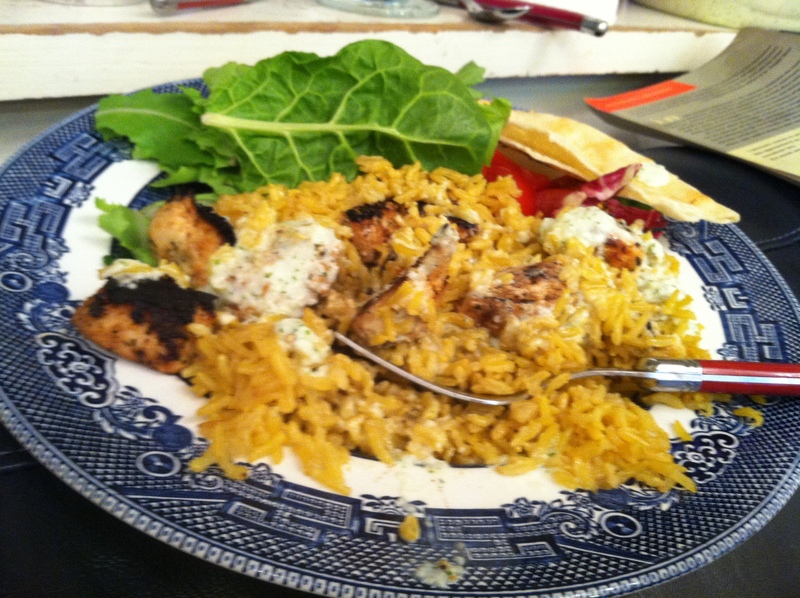 Cook the chicken: Combine lemon juice, oregano, coriander, garlic, yogurt and olive oil in a bowl. Cut chicken into 1-inch/bite-sized pieces and marinate it for 15 to 40 minutes in that mixture. Heat 1-2 table spoons olive oil over medium high heat and cook chicken and its marinade about 10 minutes or until it’s done, reducing heat if it starts to burn. 3. Make the sauce: Peel the cucumber and cut it in half. Scrape a spoon down the center to remove the seeds. Grate the cucumber on the large holes of a box cutter or just throw it in the food processor with the mint and/or dill, olive oil , vinegar and garlic. Once those ingredients are mixed, add the Greek yogurt, plus salt and pepper to taste. For a thicker sauce, add a little more yogurt. To serve: Pile the rice on a plate. Top it with the meat. Drizzle the sauce over everything. Serve with pita bread, tomatoes, salad. The sauce doubles as a salad dressing. Sometimes simpler is better. At least that’s what I kept telling myself as I was preparing this dish, which is officially called “Kentucky-style okra, corn and tomato stew.” It’s from a Cook’s Country book called America’s Best Lost Recipes which, as you can probably imagine, is about recipes that people lost and then somehow found again. Most of these recipes were lost for longer than say a day or two meaning that they are now pretty old. So the first thing I noticed (aside from the abundance of desserts–it appears that people don’t really lose dinner recipes or perhaps they just don’t care to find them again) is that many are entirely lacking in flavorings beyond your basic salt and pepper. This seems to be the way many people in the U.S. cooked for much of the past century. I know that my grandmothers’ recipes are this way–you are lucky to find one that contains a clove of garlic or an onion, much less, god forbid, something as exotic as a tea spoon of oregano. Often, I treat such recipes like coloring books, filling out the bland, blank spaces where the flavorings should be with dashes of cumin, dots of chipotle chilies and shadings of sofrito. With this recipe, I was tempted to follow this route until I read the recipe’s introduction: The dish was passed down from a woman a ran a reservation-only restaurant out of her home in Jeffersontown, Kentucky. It was one of her most requested recipes and also a family favorite.When her great nephew finally learned to make it, he was shocked that “such fullness of flavor could come from such simple ingredients–no onions, no garlic, no spices–just okra, corn, tomatoes and some salt and pepper.” More than most people, I am a sucker for a good story or a bad one or even just the hint of one. What would that have been like? Running a reservation-only restaurant out of your home in a small Kentucky town? For once, I decided to let my stupid imagination flavor the dish and, instead of adding cumin or stirring in onions, I just followed the directions. The results were delicious, although I have to admit, I still maintain that the dish would benefit from a sauteed onion and maybe a little bacon. (Although certainly less healthy, it would probably be delicious to replace the butter or oil with bacon drippings.) But the technique for de-sliming okra was priceless (i.e. sautee it in cornmeal). 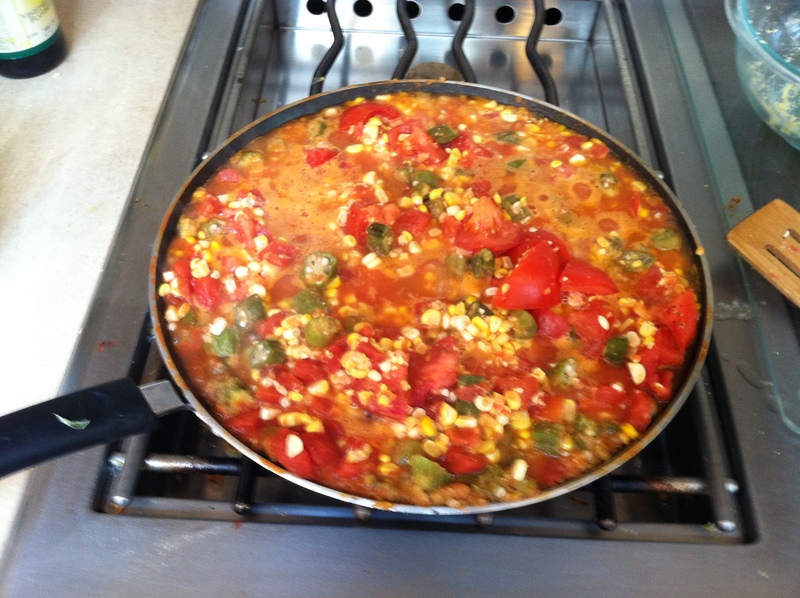 And the combination of okra, corn and tomatoes was light, healthy and perfect for summer. 2 cups okra. Trim the ends and cut them into 1/2 inch rounds. Cut the kernels off the corn cobs, then hold the cobs over the cut kernels and scrape the cobs with a butter knife to remove the milk and pulp. Toss the okra with the cornmeal in a small dish. Melt the butter or heat the oil until it shimmers. Make sure you use a very large skillet, preferably a 12-inch, because 4 pounds of tomatoes take up a lot of space. Saute the okra in the butter or oil, leaving behind any excess cornmeal in the dish. Once the okra is golden brown, stir in the corn, tomatoes, water and half a tsp of salt. Bring to a simmer then cook, uncovered, for about 1 hour, until the water has evaporated, leaving behind a thick sauce. Season with more salt and A LOT of pepper, preferably fresh ground. In the past three weeks, the temperature in Denver has hovered near 100 almost every day and I’ve made this salad four times. There’s something about the cool noodles and fresh herbs that makes me crave this dish every time the mercury inches past 90. I think it’s because it tastes like summer. The recipe is a bit of a guideline. You can add the chicken, or not…add the cucumbers or sub them for carrots or a different crunchy, raw vegetable. You can even add in some lettuce but this would probably ruin the dish as a leftover so you’ll probably have to eat it all in one night. I’ve cobbled together the recipe below from several different recipes. I’ve made it with chicken, pork and tofu. The version below most closely resembles the recipe from my favorite cooking blog, Smitten Kitchen, which is a simplification of this recipe from The New York Times. But I’ve also tried a version I found in Cook’s Illustrated’s book, “The Best International Recipe” and it was also delicious and did not call for the peanut dipping sauce. Whatever you do, don’t sweat it. After all, it’s summer. Dipping sauce: I tossed everything in the food processor, including the garlic cloves and the chili peppers. If you don’t have a food processor, chop the garlic and chili peppers and stir them into the remaining ingredients. Make the peanut dressing: Again, I used the food processor. But I’m sure you could also use arm power. Whatever you do, I think it makes sense to grate the ginger into the remaining ingredients. Marinate the chicken: Stir together about 1/2 the dipping sauce and 1/3 the peanut dressing for a marinade. Combine remaining sauce and dressing and set aside. If using pork or chicken, add it to the marinade mixture and toss to coat. Let marinate at least 15 minutes but not more than an hour. If you are using chicken and you plan to grill it, pound it to an even quarter inch or so before you marinate it to ensure it cooks evenly. 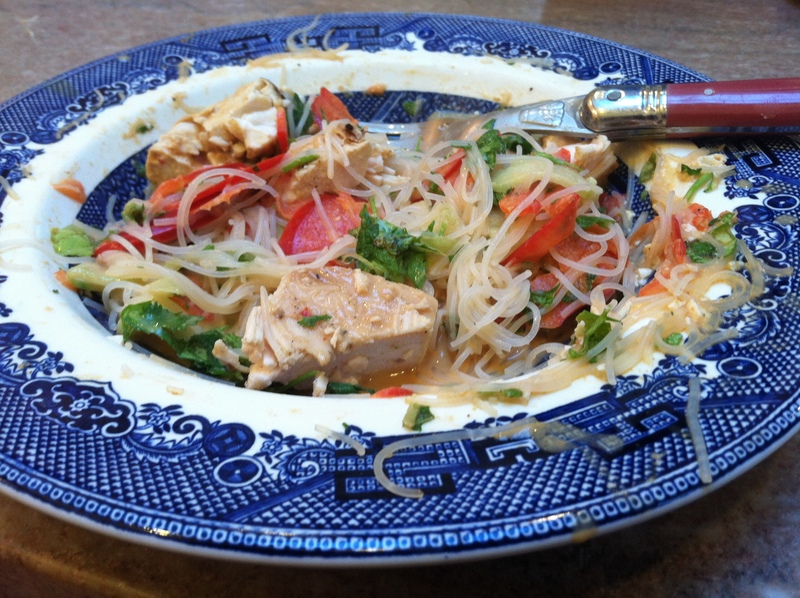 If using tofu, set aside the marinade ingredients to toss with the tofu after it’s cooked. Cook the noodles: Bring a large pot of water to the boil, then turn off the heat. Add the rice vermicelli and soak for about 10 minutes or follow package directions. Drain, cool under running water, then drain again. Protein: Grill the chicken, pork or tofu on an outdoor grill or broil it about 3 to 4 minutes a side for chicken, a little longer for pork. Let it sit for a few minutes, then chop it into bite size pieces. If you made tofu, toss it with the marinade you set aside. Assemble salad: Toss noodles with the mixture of peanut dressing and dipping sauce that you set aside after making the marinade. (You might want to use only some of this mixture and leave the rest for people to add on their own.) Toss dressed noodles with chopped cucumber, sweet peppers and fresh herbs. Top with chopped scallions, chopped peanuts and protein. To quote my steak-obsessed dog, the most wonderful time of the year is almost upon us. Namely, barbecuing season. Fortunately, Denver Post food columnist and local chef John Broening recently published his favorite recipes and one of them is a barbecue-worthy salad. Although some of Broening’s stuff is a little tedious for a home cook (he’s kind of obsessed with fava beans, each of which must be peeled…twice), his salads are a little more my speed. His oatmeal salad is a quick and delicious favorite. This most recent salad is equally easy and fast. 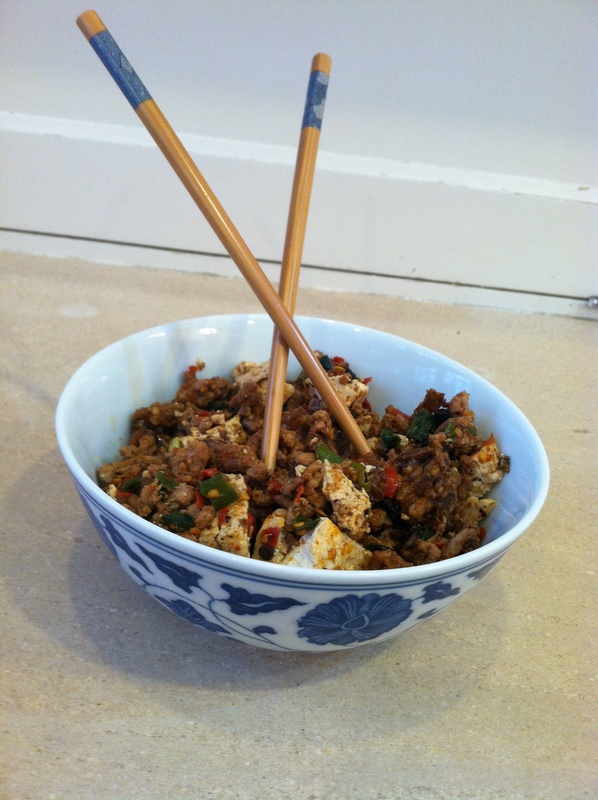 It’s a quinoa salad with Asian flavors. I’ve noticed that quinoa is now available at my local Safeway so it’s not even Whole Foods-exotic anymore. It cooks in about the same amount of time as white rice and is considerably healthier. While it’s cooking, you have just enough time to sautee the mushrooms, toast the almonds and mix together the dressing. I plan to debut it at my first barbecue of the season which might have to be tomorrow. Rinse the quinoa unless the package says it’s been pre-rinsed. Chop the onion (or shallot) and the garlic. (I threw them together in the food processor). Heat olive oil then sautee the onion and the shallot until the onion is soft but not brown. Add the quinoa and stir to coat it with oil and onion. Add the water, a pinch of salt and pepper to taste. Here’s where I let the rice cooker work its magic by putting the mixture through one basic (6-minute) cycle. If you don’t have a rice cooker, bring the mixture to a boil, cover, turn the heat down to low and cook 18 minutes. When it’s done, you’re supposed to fluff it then spread it on a baking sheet to cool but I was feeling lazy and just tossed it in a bowl. Heat a skillet over high heat. Add the almonds. Toast them until they brown watching carefully because they burn easily. Set almonds aside. Add oil to the same skillet. Add mushrooms and soy sauce. Sautee mushrooms about 10 minutes, or until the have lost most of their moisture. Slice the scallions. Combine all ingredients in a bowl and stir vigorously. Combine the quinoa with the other ingredients in a big bowl. Mix well. Add the dressing. Mix well once more. 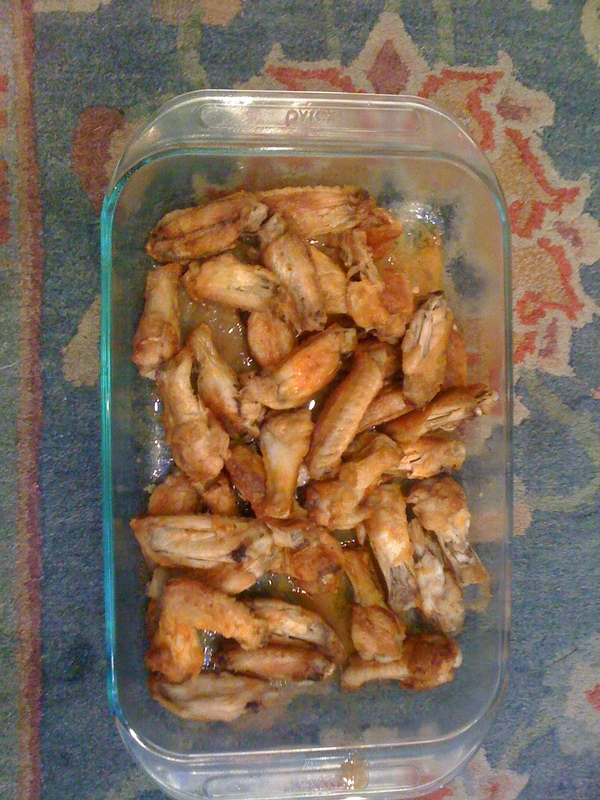 Just in time for the Superbowl, here’s a chicken wing recipe that I have been making forever, which, given how recently I started cooking, means I’ve been making it since 2010. That’s when Food & Wine buried what-in my opinion-should have been a marquis recipe–in the test kitchen section of its February issue. When I served it to the family over Thanksgiving, I mentioned that I had made the wings that evening. My mother-in-law said, “You mean you bought them at Safeway and warmed them up?” I basked in the glow for a moment before I confessed that, no, I actually made them. Then, I confessed that I had baked them, which of course automatically cancelled out my flaming- hot -oil-standing- over- a- hot- stove- kitchen- cred. If you use a Silpat, your cleanup will be as easy as your cooking. Serve them with this blue cheese dipping sauce, which is straight out of Cook’s Illustrated’s “The Best Light Recipes.” I’ve been told this is the best blue cheese dressing ever but I think that’s because most of use bottled dressings and home-made just tastes better. Preheat oven to 500 degrees. Line a roasting pan with a Silpat (for super easy cleanup) or with foil sprayed heavily with vegetable oil. (The original recipe calls for a baking sheet but I found that the oil spilled all over the oven unless I used a pan.) While the oven preheats, mix the flour, salt and pepper in a large bowl. Put the chicken in the bowl and toss. Transfer chicken to the prepared roasting pan and bake for 25 minutes. Remove the pan from the oven and flip over each wingette and drumette. Return the pan to the oven and cook for 10 to 20 more minutes, depending on your oven. Remove chicken from the oven and put it in a dish. Microwave the butter until it melts. Toss the butter with the Frank’s hot sauce. Pour the butter and hot sauce mixture over the chicken and toss. Combine all the ingredients in a bowl. It’s ready to serve. It also keeps well in the fridge.